Home / D&D / What is Ivershill? The Statue of Iver, Reluctant Founder of Ivershill. "Four centuries ago an old grumpy Dwarf named Iver made his way into the hills before the Arakeen mountains. His goal was to escape the triflings of civilization, but there he found gold. Much to his dismay, a town sprung up around him, which came to be known as Ivershill." -So reads the plaque on Iver's Statue in the center of town. Ivershill was an idea I had kicking around for sometime. 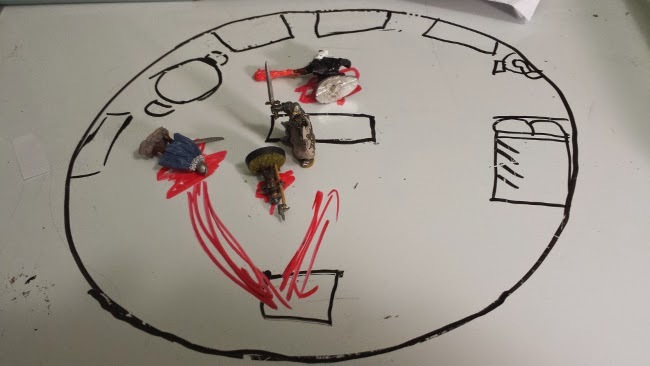 I wanted to create a D&D scenario, that was light and fun; a setting that new players could break their teeth on, while still providing a challenge for the more experienced ones. So one day, I just decided to host it, completely off the cuff. This is what it grew into. What is Ivershill all about? 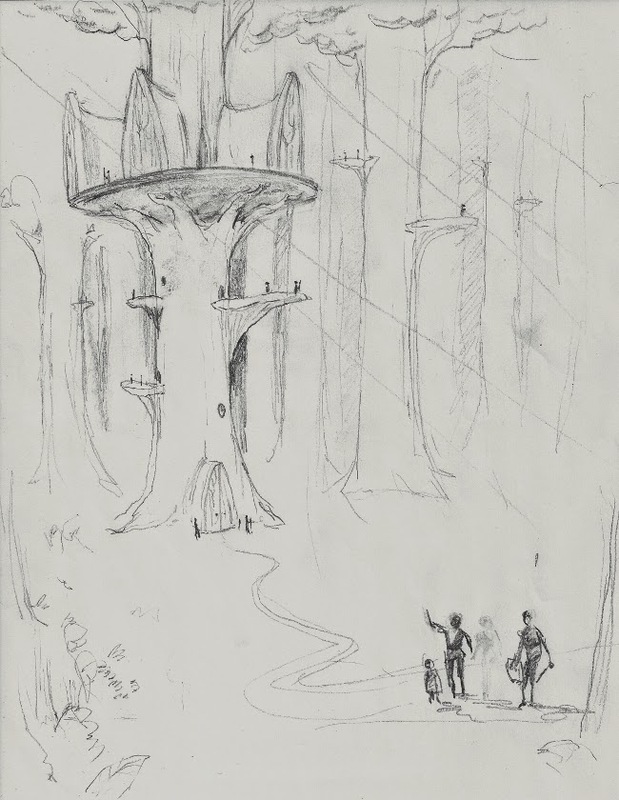 Ivershill is a wholly generic fantasy setting, almost to the point of cliché. It has all the classic Dungeons and Dragons races available, meaning that no player character would be out of place. Mirosh Ubogh Kaila's Lawful Good Half-Orc Fighter. 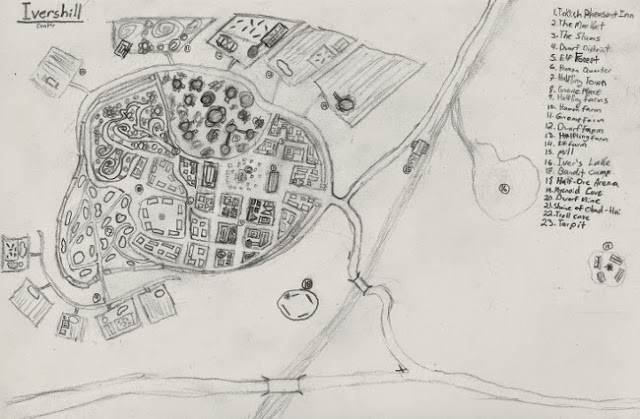 The town itself is a sandbox, with a one in three chance of something different happening in every encounter. So every game is a little different. The game always starts the same way. 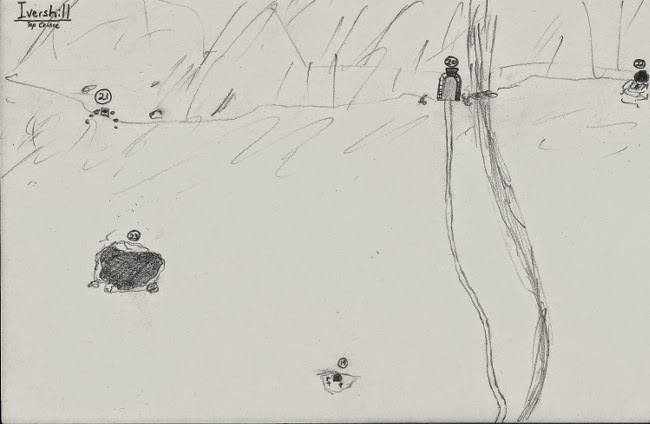 Player's are a group of adventures, traveling along a remote section of King Eadred's highway. Remote, but not unused. Foot, and cart tracks dot mark the dirt road, and the ocasional pile of horse droppings, shows the road's use. The players travel the road, until they encounter one of three characters: a Farmer looking for his lost wedding ring, A Foppish Prince enjoying the weather, or a Bandit looking to exact a toll. Each one of these characters will give the player's something to do, or guide them towards the town of Iver's hill. 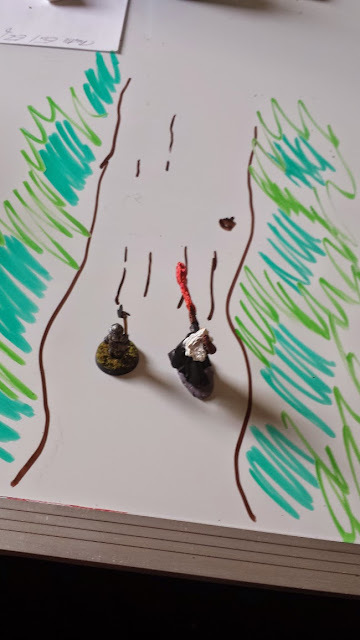 After encountering the Farmer, and not finding his ring, Ivershill's First Evil party heads towards town. Ivershill itself is bustling with activity. The dwarven gold mine at the base of the Arakeen mountains provides the town with much of it's income and business, and you can always find work there. But be warned, there are rumours of goblins on the 12th level. To the North of Ivershill. The town is divided into different districts on for each major fantasy race, and each featuring the distinctive architectural style of all of the fantasy races. however but there is plenty of intermingling and you can just about anyone anywhere and they can all be found scattered through out the city. In every area, there are dozen of shops with colourful characters to interact with. 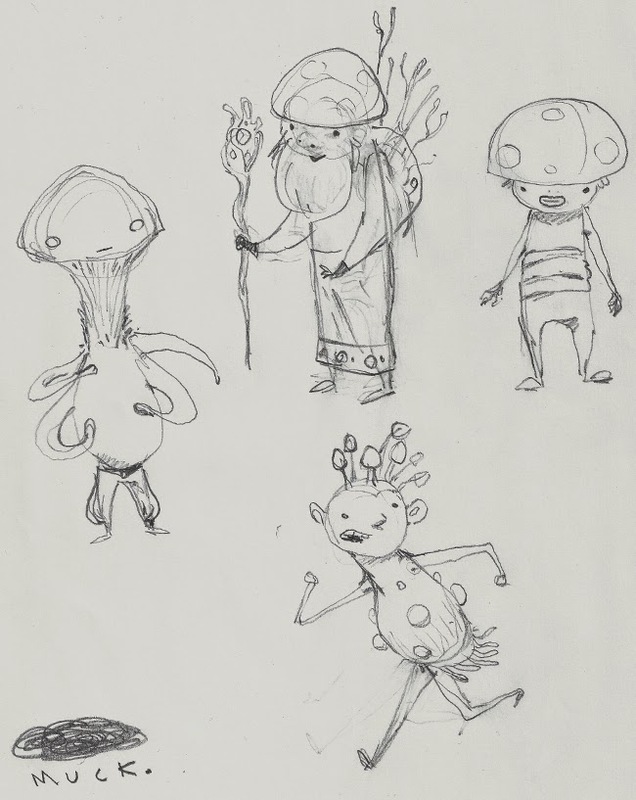 Some of these are simple merchants, but others will have jobs that they need done around the town. 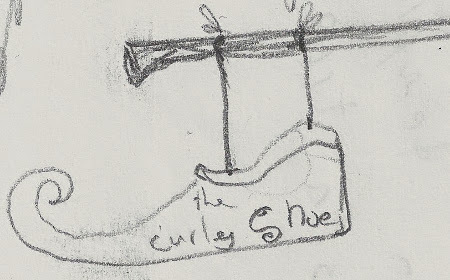 The Sign on the Curly Shoe Tavern in the Elf District. The jobs you can get around Ivershill range from the mundane -fetching items for a baker- to the fantastic, -encountering the Mycnoids when looking for the assistant of the Bar Tender of the Ticklish Pheasant Inn. The Mycnoids... And the Muck they live in. Ivershill has diplomacy, mystery, NPC interactions, puzzle solving and it's share of combat. 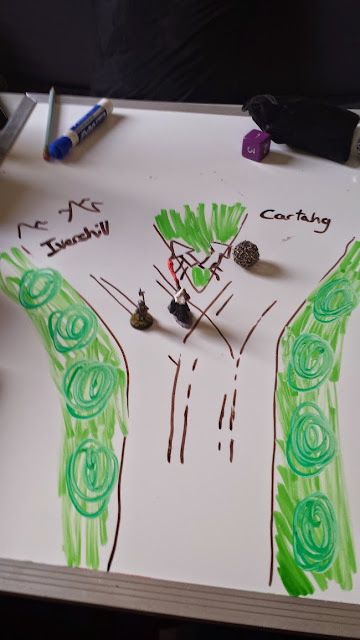 There is a Half-Orc Fighting Ring in the woods outside of town, bandits have setup camp on the other side of the river, and there is a troll cave up in the mountain, not to mention the other creatures that live in the woods! The Farms surrounding Ivershill are regularly a source of adventure, as they are often attacked by the strange creatures that live in the woods are raided the bandits. 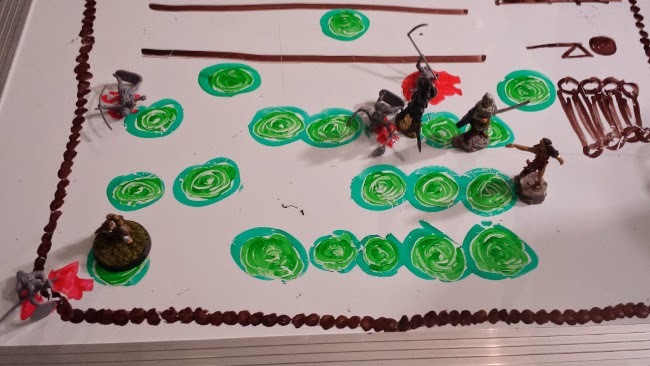 These bandits learned the hard way that stealing is wrong, as Ivershill's first good party defends the cabbages. 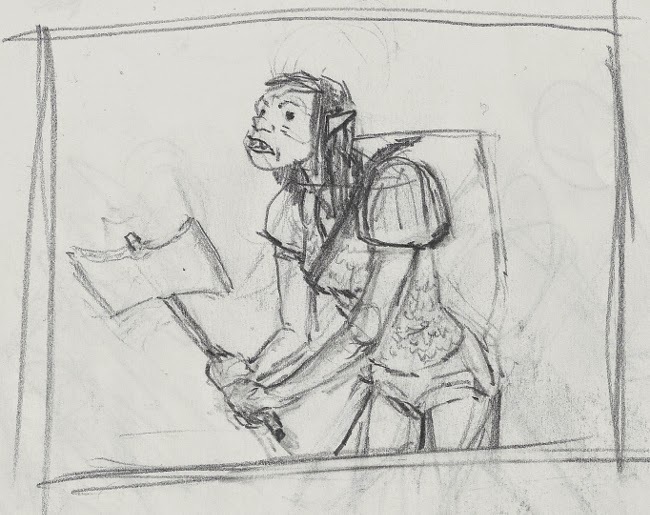 Players are given the freedom to do what they wish during the game, but like any good Dungeons and Dragons campaign, their actions are not without consequences. Helping or hindering the people around you can turn people into life long friends, or bitter enemies. The Elf and Halfling lay dead, slain by the Elven Forest Guards... Maybe attacking that shop keeper was a bad idea. Wesley and I are going to continue writing and designing more of Ivershill, creating a rich and fun environment for all players to interact with. We will keep you posted, as we continue the adventures in Ivershill. 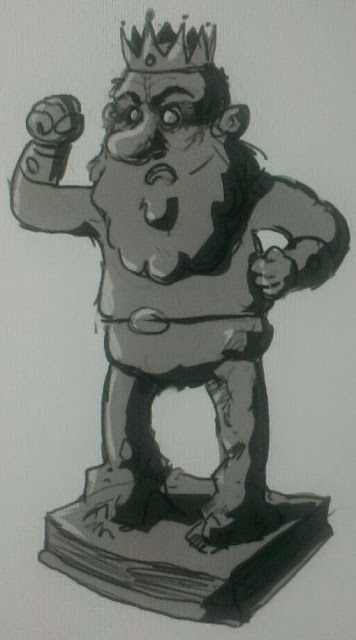 If you like Wesley's sketches, check out more of his fantastic art and animations on his blog.